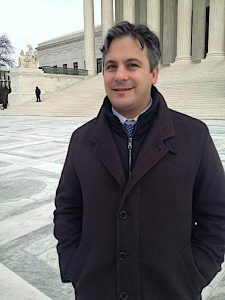 Attorney Jonathan Katchen outside the U.S. Supreme Court in 2016. Photo: Liz Ruskin. Anchorage attorney Jonathan Katchen has withdrawn his name from consideration for a judgeship on the U.S. District Court in Anchorage. President Trump nominated Katchen to the court in April, but the Senate Judiciary Committee never scheduled a confirmation hearing. Katchen said the process and the timing were uncertain and said he decided to end the waiting and focus his attention on his legal practice. He’s an attorney at Holland & Hart. Katchen is in his early 40s and was a law clerk for Judge Maryanne Trump Barry, the president’s sister. His nomination had enthusiastic support from U.S. Sen. Dan Sullivan. Sullivan was Katchen’s boss at the Alaska Departments of Law and Natural Resources. Both of Alaska’s U.S. senators jointly submitted a list of five candidates for the president to consider. But Sen. Lisa Murkowski did not issue a statement supporting Katchen. In a poll of Alaska Bar Association members, only 31 percent of respondents rated Katchen well- or extremely-well qualified for the federal bench. It was unclear how many of the remaining respondents just didn’t know the name. Katchen has focused on regulatory and natural resource law. He has little trial experience and doesn’t take criminal cases. By contrast, the top-rated candidate in the bar poll was Eric Aarseth. He’s widely known among lawyers because he’s a state Superior Court judge.